Is a billion euros enough to understand the human brain? The Human Brain Project thinks it’s a good start, and evidently the European Commission agrees. On January 28, the Human Brain Project was one of two projects to be awarded a billion in backing from the European Commission’s Future and Emerging Technologies (FET) Initiative. Henry Markram, the project’s founder and co-director, hopes that over the next decade the project’s consortium of 80+ institutions will use up to an annual $100 million in funding to build a complete digital model of the human brain. The better we know the brain, the better we can diagnose and treat neurological disease, and maybe—in the greatest feat of natural reverse engineering to date—the better we can build computers and software as flexible, powerful, and efficient as the brain itself. At least, that’s the goal. The Human Brain Project is a collaboration of over 80 institutions slated to run from 2013 to 2023 and receive up to $100 million in funding per year. But the original undertaking dates back to mid-2005 when IBM and Swiss University École Polytechnique Fédérale de Lausanne (EPFL) launched the Blue Brain project under the direction of Henry Markram founder of the EPFL’s Brain Mind Institute. 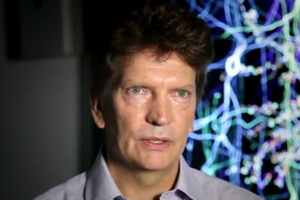 The Blue Brain project went on to use supercomputing resources provided by IBM (a BlueGene/L followed by a BlueGene/P supercomputer) to create a working model of a single cortical column in a rat brain—about 10,000 neurons. The model is still being refined using new data, and researchers run it every two weeks. To guage the model’s accuracy, the team attempts to recreate experiments already conducted on real neurons and claim it is approaching high levels of realism. However, the Blue Brain project’s loftier goal of simulating the entire human brain—a feat Markram has claimed can happen inside a decade—required a larger organization and more resources. The Blue Brain project was the proof of concept and will be the command center for the larger Human Brain Project, conceived in 2010. Now they’ve got a billion euros in the pipeline—what can we expect from the Human Brain Project? For one thing, like other ambitious and data-heavy operations, the project will require exascale computing. That’s 100 times more powerful than any supercomputer currently in existence. Another well-funded program gunning for exascale bodes well for the world of supercomputing, if nothing else. And the project could advance our understanding of neurological disorders. Henry Markram will direct the Human Brain Project. But what about AI? Markram is careful to note that the goal is not to recreate human intelligence, but to map the connections that give rise to human intelligence. Though it is undoubtedly now the most well-funded undertaking to understand the brain, the Human Brain Project is far from alone. IBM and DARPA’s SyNAPSE recently completed a 100 trillion synapse simulation based on the connections in a macaque brain. Spaun is a working (albeit very simple) cognitive computer. Meanwhile, Ray Kurzweil’s latest book, How to Create a Mind, outlines his ideas on how to reverse engineer the brain—his new post at Google could result in some interesting brain-related projects. And not to be outdone by the EU, the Obama administration is expected to announce the details of a ten year, multi-billion dollar project to map the human brain in the coming weeks. Governments and academic institutions seem comitted to throwing everything but the kitchen sink at the problem of the brain. It’s reminiscent of Apollo or the Human Genome Project. And arguably, giant lump sum public investments (and the inevitable international competition that goes with them) are needed to jumpstart such massive scientific endeavors. But politics and public funding are fickle beasts. Equally important are the new neural networks—80+ institutional collaborators in the Human Brain Project alone—forming in the global brain. Whether or not we reach the lofty goal of fully modeling the brain in a decade, we’ll certainly have learned and begun to apply much from the process.